Repsol Honda’s Marc Marquez made it five wins in a row (2x Moto2™, 3x MotoGP™) at the legendary Indianapolis Motor Speedway after an epic race long duel with Jorge Lorenzo (+0.688s) on the Movistar Yamaha. 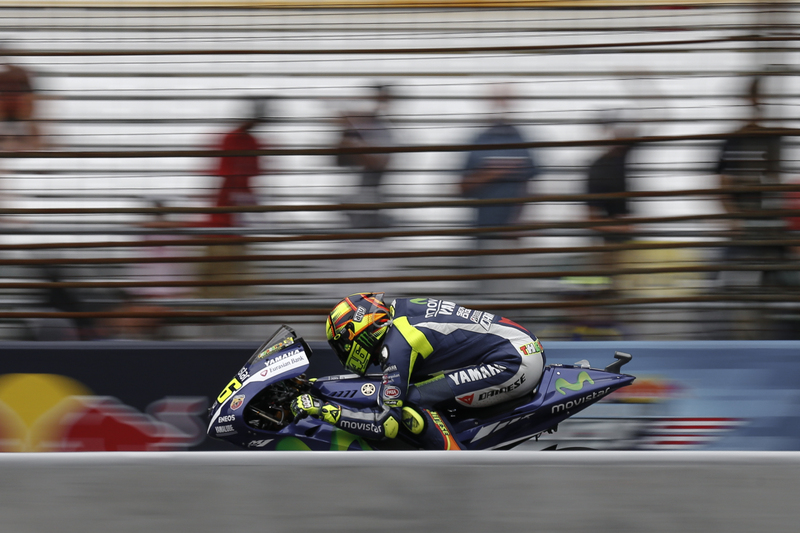 Championship leader Valentino Rossi (+5.278s) maintained his 100% podium record this season to finish in third, and remain on top of the standings by nine points. After the Moto3™ and Moto2™ races were declared wet earlier in the day, conditions had improved by the time the MotoGP™ riders took to the grid and luckily, apart from a few spots of rain, it remained dry throughout the race. It was Lorenzo who would lead into the first corner from pole man Marquez, and it wouldn’t take long for these two to break away at the front of the field, opening up a second gap by the end of lap 8. The 68,000 fans present at the ‘Brickyard’ then bore witness to some incredible riding between the two Spaniards, as lap after lap Marquez ominously stalked Lorenzo. 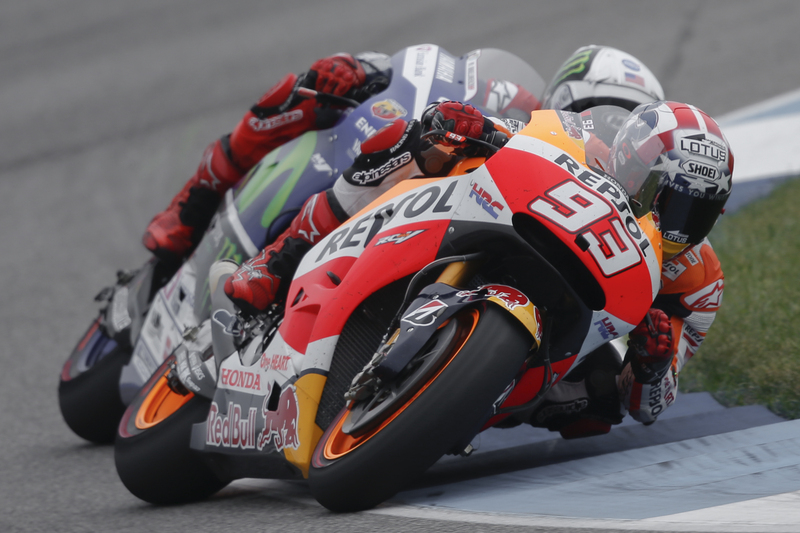 The reigning MotoGP™ World Champion Marquez bided his time, sitting behind Lorenzo and studying his strengths and weaknesses before finally making his move with just three laps to go into turn 1. Lorenzo had no response and Marquez pulled the pin to cross the line over half a second ahead of his compatriot, taking Honda’s 700th GP victory in the process. It was also the 9th race in a row that Marquez has won on US Soil and the first time he has achieved back-to-back victories this season. Rossi started from 8th on the grid but after a sensational opening lap he was up into fourth and hunting down Pedrosa for the final podium spot. The Italian was made to rue his poor Qualifying performance, as while he could match the pace of Marquez and Lorenzo at the front, he could not make any meaningful dent in the gap to the leaders. Rossi finally managed to overtake Pedrosa into turn 1 on lap 18, although the diminutive Spaniard was having none of it and after recovering he managed to re-take third, setting up a dramatic last lap showdown. On the last lap Pedrosa overtook Rossi into turn 1, but ‘The Doctor’ fought back immediately and made it stick, managing to hold on to cross the line 0.181s ahead of Pedrosa (+6.147s). Ducati Team’s Andrea Iannone (+21.528s) was a further 15 seconds back in fifth as he managed to hold off a hard-charging Bradley Smith (+21.751s) on the Monster Yamaha Tech 3 towards the end of the race. The Italian, celebrating his 26th Birthday, eventually crossed the line just 0.223s ahead of the Brit. Smith, starting from 9th on the grid, once again enjoyed a brilliant start and found himself as high as 5th after the first few corners. Unfortunately he would run wide at turn 10 on the first lap and be forced to fight his way back through the field. He had to settle for sixth. His teammate Pol Espargaro was a further 8.627s further back in seventh. CWM LCR Honda’s Cal Crutchlow had an eventful race, dropping down to 11th after almost clipping the back of Smith at the start of the race. He had to fight his way back into the top ten, before eventually crossing the line in eighth. Andrea Dovizioso also ran wide on the first lap (turn 2) first lap and found himself down in very last place. The Italian recovered brilliantly and fought back to finish in ninth ahead of the Factory Octo Pramac Racing Ducati of Danilo Petrucci, who completed the top ten. The Team Suzuki Ecstar GSX-RR’s of Maverick Viñales and Aleix Espargaro were 11th and 14th respectively, with Scott Redding on the EG 0,0 Marc VDS Honda finishing in 13th. Avintia Racing’s Hector Barbera took the Open class victory in 15th ahead of local Hero Nicky Hayden (Aspar MotoGP Team) in 16th and his teammate Eugene Laverty in 19th. Stefan Bradl finished in 20th on his debut for the Aprilia Racing Team Gresini while CWM LCR Honda’s Jack Miller was the only rider to crash out of the race as he fell foul of turn 6 on lap 9. All of this means that Rossi (195pts) remains on top of the MotoGP™ World Championship standings, although his lead over second placed Jorge Lorenzo (+186pts) has been cut to just 9 points, with Marquez (139pts) a further 56 points back in third.